Royal Wheels India is an adventure travel group organising Golden Triangle Tours Package in India. Arrive at Bangaloreand check-into the hotel. In the afternoon you will be taken for a sightseeing tour ofBangalore, where you can visit the Lal Bagh gardens, the Parliament Building Vidhan Soudha and the Visvesvaraya Industrial and Technological Museum. Overnight stay at the hotel. known for its noted 17 metre high image of Lord Gomateshvara on the top of Indragiri hill. Overnight stay at the hotel. 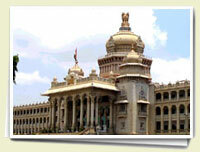 The full day excursion to Belur and Halebid, the historical places of Karnataka. Overnight stay at the hotel. Drive to Mysore from Hassan. After the breakfast, start with the sightseeing tour of Brindavan Gardens and Palace. Overnight stay at the hotel in Mysore. Reach the airport to board a flight to an onward destination or way back home. Arrive at Chennai and check-into the hotel. Spend half day in sightseeing tour of Chennai. Overnight stay at the hotel. 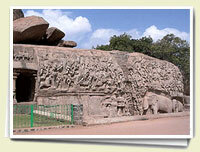 Drive to Mahabalipuram, the world heritage site famous for the monolith temples dating back to centuries. Also visit Kanchipuram, the city of temples enroute. Reach Mahabalipuram to have an overnight stay at the hotel. Spend the whole day in the sightseeing tour of Mahabalipuram visiting shore temple, Arjuna's Penance, Krishna Mandapam, Five Rathas and beach. Overnight stay at the hotel. Reach the Mahabalipuram airport to board a flight to your onward destination or way back home. On Arrival at Kochi (The natural harbor of India)airport,meet and assistance by our company representative followed by transfer and check into the hotel .Later on enjoy the harbour cruise and Kathakali Dance Show in the city. Overnight stay at the hotel. the local people. Also visit the beautiful bird sanctuary. Board the traditional rice boats - "Ketuvallam" sailing through the picturesque backwaters and small amidst the Kerala's beautiful scenery. Overnight stay at the hotel. Disembark the boat at Kumarakom. 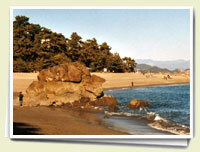 Visit the bird sanctuary thereof. The rest of the day is free for other activities at the resort. A boat cruise on the Vembanad Lake dotted by the swaying coconut palms on the distant banks. Overnight stay at the hotel. In the morning after breakfast, Leave Kumarakom for Kochi/Thiruvananthapuram. Board a flight way back home or to your onward destination from the Cochin/Trivandrum international airport. In the morning after breakfast, Drive to Puri enroute visiting villages of art and applique, afternoon relax on Puri beach with sun, sand & surf. Overnight Puri. In the morning after breakfast, Drive to Chandravaa beach catch the natural beauty in your camera, enroute to Konark visit some wonderful and beautiful fishing village, after the sun temple back to Bhubaneswar. Via Dhauli, over night at Bhubaneswar. 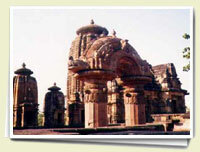 In the after breakfast, go for half day sight seeing of Bhubaneswar and after lunch shopping, departure for onward destination.